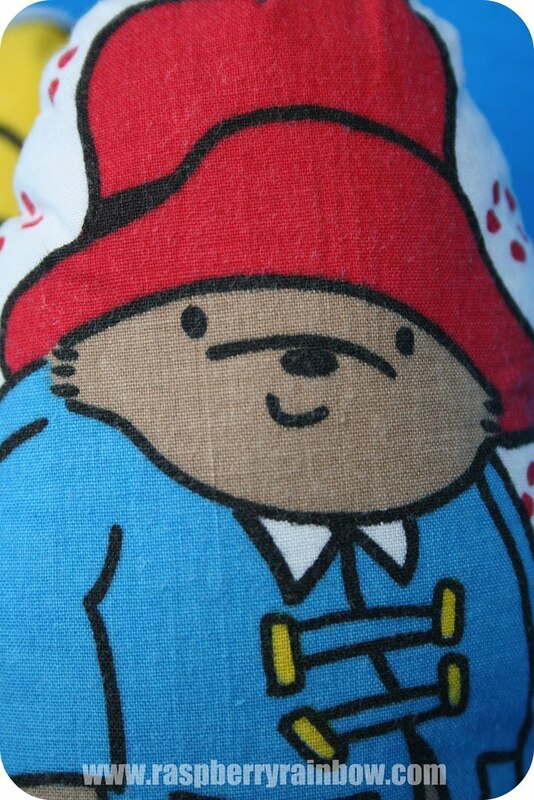 Raspberry Rainbow: Do you like Paddington Bear? 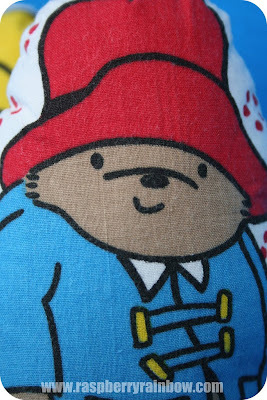 Do you like Paddington Bear? Would you like to win a Paddington Bear baby Rattle? Please leave a comment below to go in the draw. All you have to do is tell me your favourite colour, as there will be an extra little surprise sent with Paddington. Easy. Open to everyone, I will post any where on planet Earth that has an address. Hand made by me, using vintage Paddington Bear fabric on the front and 100% blue cotton fabric on the back with a rattle inside. Approximate dimensions are 18cm x 10cm x 5cm. Fully washable - on a cold/cool gentle machine or hand wash.
Give-away closes at 8pm on Monday 18th October 2010. Feel free to tell your friends and use these images if you blog about this. We love Paddington bear....i remember seeing this on one of your old posts and LOVED it...i love lots of different colours for different reasons. I can never get enough white, but i do love duck egg blue and navy for my little boy. Have a fun day! 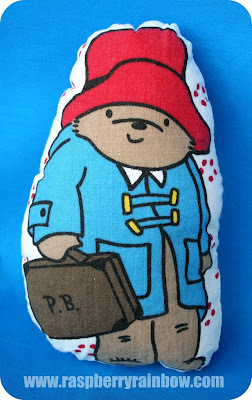 I remember buying a Paddington Bear on my first trip to England - that was about 15 years ago now! Over the years my favourite colour has changed from purple to green and now I love all things yellow. How can you not like a colour that's so bright and sunny? Thank you for this lovely competition. I very fondly remember reading Paddington to my boys when they were little. My favourite colour is red.